Don’t you love the icon that I use for every Fan Mail Wednesday? A word of explanation for younger readers: It’s an illustration of something we used to call “a letter.” You see, long ago, we used to — and you’re not going to believe this — write words on actual paper (made from trees!) to our friends and relatives and business associates. Then we’d place the paper in a sealed envelope, called an ENVELOPE, and then . . .
Hi, I was at the school that you were at today at Vail Farm 3/30. I was wondering how you come up with titles because I’m a writer too. I’m writing a book that is about a girl who gets picked on a lot just like the book bystander. But just so you know I didn’t steal it from you. But any way I can’t come up with a title for it so that’s all I want to know. Hey, X. Thanks for writing. You must have been one of those students with your hand raised when we ran out of time. Sorry I didn’t call on you. Titles are a tricky business. I can’t say that I’m an expert. With books like Six Innings and Bystander, I had those titles very early on. In fact, writers will often plug in a “working title” for a book in progress. It’s not the final title, or at least doesn’t seem to be, it’s just something handy to call the untitled book. For Six Innings, my working title was . . . Six Innings. That was always the concept for the book from the beginning, very clear in my mind. So when it came time to officially name the book, I used the working title. With Bystander, my first title idea was Predator. That’s because I began by focusing my research and note-taking on the bully character, Griffin Connelly. But after a short while, I became convinced that the real story was with the bystanders. In life, there are a few bullies and some victims, and then there’s the rest of us, the overwhelming majority, the bystanders. We are often silent, yet hold all the real power. I knew it should be the focus of my book, and the title. Of course, there are all sorts of bystanders. The floaters and the enablers, the watchers and the cheerers and the ones who simply walk away — all with our own roles to play in the schoolyard drama. Few of us are purely innocent. Speaking of bullies, have you ever noticed that they almost always need an audience? They don’t bully unless there’s somebody to watch it, to cheer them on, to laugh. Fights are the same way. It’s interesting when you think about it, isn’t it? What would happen if there was no audience? Do bullies need bystanders in order to exist? Are we their oxygen? Back to titles: In many cases, writers don’t have a title until the book is finished. Editors have told me not to worry about the title, just write the story, worry about the title later on. It can be hard, because you do need a good title. I wanted my title for Justin Fisher Declares War to be Justin Fisher Declares War on Fifth Grade, but that was vetoed due to length. I never felt that we got that title right. 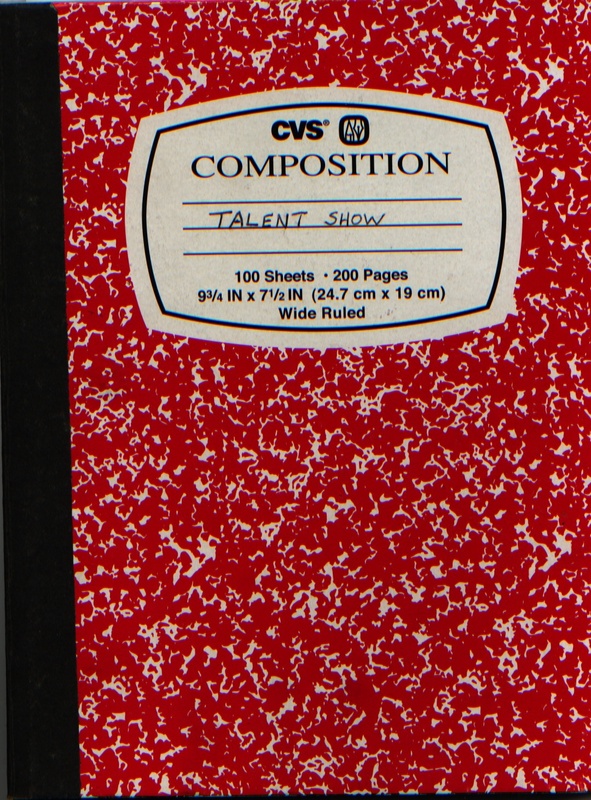 When I begin a book, I often purchase a composition notebook. 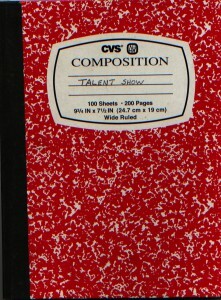 My working title for Justin was Talent Show. Maybe I should have stuck with that. 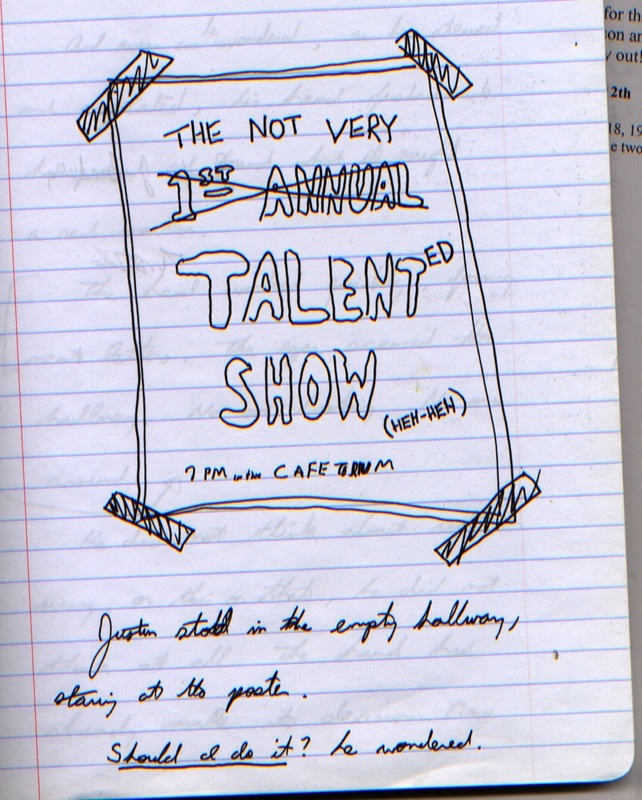 Here’s the first page from that notebook. I wrote it in the Bethlehem Library in Delmar. I had this idea of Justin defacing a poster in school and it’s the first scene I wrote, event though it doesn’t happen until Chapter Four of the book. Often writers will go back over a story and see if there’s a word or phrase in the text that somehow stands out. You’ll see that a lot when you read books, the book’s title buried somewhere deep in the pages of the book. I’d recommend that strategy for you. Reread your story. Does a character say something that could work as a title? Is there a symbol in the book that somehow represents a character or an idea? With Jigsaw Jones, my publisher wanted a title from me before I even wrote the book or, in some cases, knew what it was about. It drove me crazy. The other strategy is to ask for help. That’s what I do. I’ll have a reader — my editor, almost always — read the manuscript and we’ll talk about titles together. Sometimes it takes another person who has some distance from the story to see what it’s really about. And isn’t that nice, when someone can give you the title? Lastly, brainstorm. I’ve created long lists of potential titles. Then you can review them, whittle them down, and maybe share them with other people. Maybe even people who haven’t read your story. Which titles appeal to them? Is there a title that gets them curious? Nowadays this is called “crowd-sourcing,” when you simply ask a bunch of random people for their opinions. Anyway, sorry, long letter. Good luck with your story. It’s always nice to meet a young author. Karl, I have published more than 80 books, of every kind and description, starting back in 1986. There are 40 in the Jigsaw Jones series.